When Ptolemy son of Lagus arrived in Egypt as satrap c. 322 BC, he was 44 years old and already a veteran of the campaigns of his childhood friend Alexander the Great. From relatively humble beginnings, he rose to become the founder of Egypt’s longest surviving dynasty and as Ian Worthington sets out to show, deserves far greater credit for shaping not only Egypt’s history but also for his significant influence on the development of the early Hellenistic world. An expert on Macedonian and Greek history, Worthington approaches his biography of Ptolemy I with a Classicist’s eye, showing how Ptolemy’s autocratic rule of Egypt stemmed from the influence of the Macedon courts of Philip II and Alexander III and his experiences fighting in Persia, Afghanistan and India. Egypt’s new Pharaoh ruled as a Macedon king; his right to rule “spear won”, supported by his own Greek elite “friends”; he encouraged Greek settlers, made Greek the language of his administration and introduced a monetary-based economy into Egypt for the first time. With few ancient sources to draw on for Ptolemy’s domestic rule, Worthington concentrates on the king’s imperial pretensions. He strongly disagrees with the prevailing idea of Ptolemy as a “defensive imperialist”, content to rule Egypt, drawn into war only when Egypt was threatened. Ptolemy was as ambitious and ruthless as any of Alexander’s Successors. Unlike most of them, he was also shrewd and patient. Egypt was a clever strategic choice of territory: rich, easy to defend and far away from the immediate struggles for the supremacy of Macedonia. While his rivals fought, Ptolemy built up his wealth and forces before picking his time to act. Stealing the body of Alexander (on route to the burial grounds at Macedon) was “one of the most audacious events of this period”, giving Ptolemy legitimacy, proving him more than equal to the other Successors. After eighteen years as satrap he, like the other successors, declared himself king (c. 305/4 BC), backdating his reign to the death of Alexander. In Rhodes he was declared a god (and given his epithet Soter or “Saviour”) after relieving a siege by Demetrius of Macedon (it was to celebrate this victory that the Colossus of Rhodes was erected – one of the Seven Wonders of the ancient world). Ptolemy died in his 80s of natural causes (other Successors each came to a violent end), the “ultimate survivor in a dangerous world”. He may have failed in his ambition to control Greece and Macedon and become the new Alexander, but he succeeded in creating a Mediterranean empire, making his new capital Alexandria (with its famous library and museum) an intellectual centre to rival Athens. Egypt became a major player in Mediterranean politics, ruled by his dynasty for nearly 300 years, until his descendent Cleopatra VII fell to the irresistible rise of Rome. The dawn of the nineteenth century, the great age of Romanticism, saw the birth and development of interest in ancient Egyptian culture and remains. Before the development of scientific excavation and the full decipherment of the hieroglyphic text, awareness of Egypt was largely based on funerary monuments and gigantic statuary. This meant that much of the literature of the period, while romantic, is often quite ‘Gothic’, being based on the imagination rather than real knowledge or understanding. This anthology illustrates the point quite clearly. The poets in this collection are a mixture of American and English, male and female, including those who actually went to Egypt and those who only visited it in their imagination. Their themes are often very similar and frequently romantic in their approach. Poems by such luminaries as Tennyson, Keats and Longfellow are included. The poets share a vision, an imaginary picture, “a desert fills our inward span” (Keats), “some grave mighty thought threading a dream”, (Leigh Hunt). Most readers will be well-acquainted with Shelley’s poem Ozymandias, but many will be unaware that Shelley’s friend, Horace Smith, also wrote a poem on the same subject [find out more in our article on the Romantics on p.48! ]. The collection is full of reflections on the passage of time, the decay of once powerful empires and mortality. Mary Coleridge meditates that “Egypt’s might is tumbled down”, while Jane Wilde muses “should we tread the dust of age; Musing dreamlike on the past”. These pages are full of references to “roofless halls”, “broken gods”, statues with “unwinking gaze” keeping watch over the centuries which pass. The writers are fascinated by the colossi of Memnon, with eyes that “fain would pierce to lands unknown”, the Sphinx, “Life’s riddle writ in stone”, and the pyramids, “Great Khufu’s giant stair”. These monuments impress by their size, their mystery and their immortality. The nineteenth century was an age when Biblical themes were popular and mysticism and magic caught the public imagination. Poems on the Exodus and the destruction of Pharaoh’s army are included here; “wail, wail Egypt, mourn and weep”. Not surprisingly there is a section on tombs and mummies. This was an age when public displays and the unwrap- ping of mummies were popular. The revelation of the remains gave rise to many meditations on the possible life of the individuals on display. Many of the poets were thoughtful or philosophical, but there are examples of less respectful thoughts, “Surely old lass, you’re safe from time’s aggression. His ancient teeth on you can’t make impression” (Benjamin Shillaber). No book of this kind would be complete without some reference to tourism. There are several poems about visits to monuments and sailing on the Nile. There are ten poems in the collection by Rev. Hardwicke Rawnsley, one of the founders of the National Trust, who loved the country, returning several times. “I left thee … in thy sands a heart was hid”. Others were armchair travellers. Alaric Watts tells us that he has no need to travel since he has “graphic Roberts for my guide at home”; any of us will recognise the attraction of David Roberts’ paintings. The final word goes to cats. A cautionary tale about a sacred cat and a naughty boy is accompanied by Rosamund Watson’s ode to her cat, “the Sphinx of my heart”. 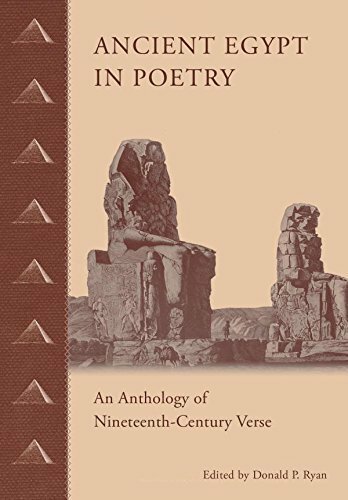 Here we have not only a collection of poems to enjoy, but also an intriguing insight into the minds of a bygone age, to be read in the context of the history of Egyptology. 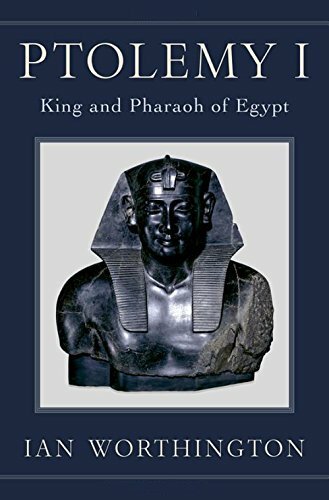 This volume is a scholarly yet very readable account of one of ancient Egypt’s little known kings, Psamtek II, who ruled between 595-589 BC. The narrative has as its backdrop one of the more interesting, yet less well known periods of ancient Egypt, the Saite or Twenty-sixth Dynasty. This was a time when Egypt was threatened on the world stage by a number of powerful empires, the Assyrian, Babylonian and finally the Persian – to whom she was to succumb. The book commences with a history of this era and précis of all the Saite kings up to Necho II, Psamtek II’s father, including the rulers of the earlier, shadowy and little understood Twenty-fourth Dynasty. This initial discussion, as with the whole volume, incorporates extensive footnotes and a comprehensive bibliography which embraces most of the more recent studies into this period – a useful resource. The domestic policy of Psamtek is covered in some detail and takes in an examination of the ‘beautiful name’ (rn nfr), a phenomenon which saw a resurgence among the officials of the Saite Period, with the biggest extension of its usage during the reign of Psamtek II. The most significant foreign campaign of Psamtek’s brief reign was his military operation in Nubia which is comprehensively analysed, as is his later expedition to Khor (modern Syria-Palestine). The question of his deletion of Kushite royal names and images from monuments both within Egypt and Nubia is addressed at some length, as is the controversial question of the supposed damnatio memoriae directed against his father, Necho II. Gozzoli sees this ‘hacking out’ of Necho’s name on monuments as a simple re-usage to promote Psamtek’s own reign while the name of Necho on private monuments was changed by their owners to Psamtek in order to demonstrate their loyalty to the new ruler: a case of usurpation rather than damnatio memoriae, unlike the defacement of the Kushite monuments which was an attempt seemingly to eliminate the memory of the Nubian rulers. 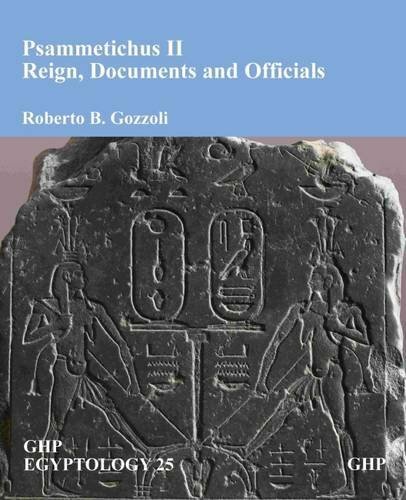 The second part of the book is a detailed catalogue of all the known royal monuments of Psamtek II and a dossier of 25 of Psamtek’s officials, which involves the objects attested to them, their inscriptions with translations, present location and bibliography – an undertaking that Gozzoli admits has taken over twenty years to complete! This volume is an important addition to the literature on the Late Period and encompasses a wealth of well-researched material, some of which is little known. An essential and stimulating read for anyone with an interest in the Saite Period. This beautifully illustrated book has been published in conjunction with a new exhibition currently running at the National Museum of Scotland in Edinburgh [see events p. 65], telling the story of one particular New Kingdom tomb excavated systematically in 1857 by Alexander Henry Rhind. Originally built for a Chief of police and his wife, the tomb was looted and reused several times up to the Roman era, as shown by the collection of objects from various eras found inside. A sandstone seated double statue of the couple forms the centre piece of the display, the only surviving object from the original burial, but a range of objects from other burials is depicted to illustrate the kinds of objects (combs, cosmetic containers, jewellery, boxes, shabti, papyri and wooden furniture) that would have been buried with the owner at this time. The recently restored mummy shroud of Aaemka and ‘Bes’ box(see AE101 News) are also included. 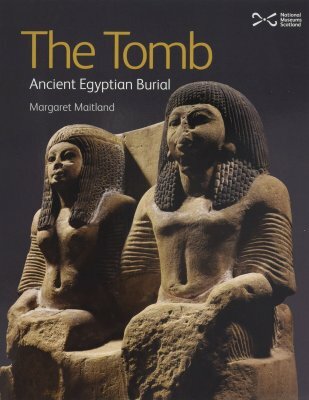 Written in easy to understand language, this is a great introduction to ancient Egyptian funerary practices for readers of all ages.